Highland Check Tablecloth is rated 4.8 out of 5 by 9. 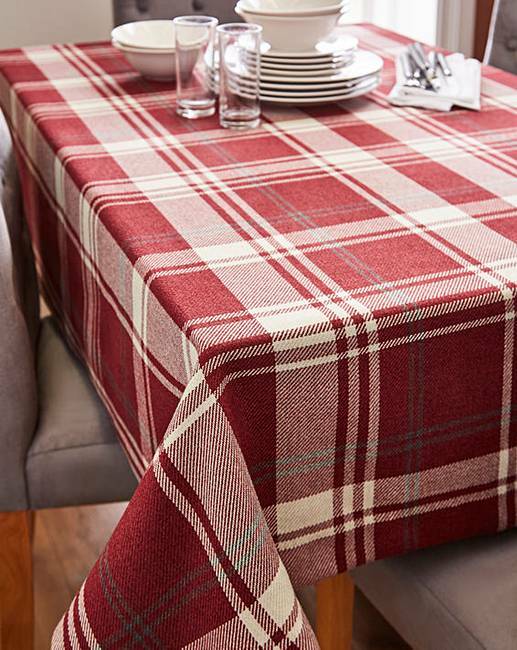 Add a festive touch to your dinner table with the Highland Check tablecloth. With a traditional check print, this is the perfect addition to your table to help protect from spills and stains. Available in more colours. Coordinating items also available. Rated 5 out of 5 by Julie from Fab quality for price Amazing quality. Washes up lovely. Was looking for one for ages and this is by far the best if seen. Rated 5 out of 5 by Ver from Realy good quality Bought this for the Christmas table . Goes well with festive table trimmings . Rated 5 out of 5 by stickus from Lovely quality! Bought these to replace our old table cloth and glad I did. The quality is excellent, colourful and they are very thick. They look great on our dining table. I would recommend to all. Rated 4 out of 5 by The raven from Value for money Unfortunately this table cloth was not right colour for our requirement , so unfortunately I sent them back. Rated 5 out of 5 by franroy from Highland Check Tablecloth After reading the reviews I bought three tablecloths as I liked the design and wanted quality. I wasn't disappointed! One red tablecloth is used as a tablecloth and the other red one has been used to make various soft furnishings. The rust tablecloth was bought to match cushion covers from the range and has been cut to make small table coverings and used as a contrast to my plain rust throw. I'm delighted that changing a few things has trtansfored the rooms. Rated 5 out of 5 by KLH from Lovely design.... Absolutely love the table cloth design. The material is very ‘wooly’ But it’s still beautiful. I bought both designs.